With ImgMeta you can add your own information to any image-file, to describe them better than its pure filename can. These information (so called meta-data) are stored in the 'Extended Attributes' (EA) of the file (read more about EAs and their special considerations ). There are up to 5 fields for supplying meta-data. You may use them, but don't have to. Fields that you don't want to use are simply left empty, or better: mark them as 'inactive' (via context-menu over the field's caption). Each of these fields may be re-named to whatever your personal taste suits, by default they are named 'Info-1', 'Info-2', etc. By using the context-menu over the field's caption you may change that caption. 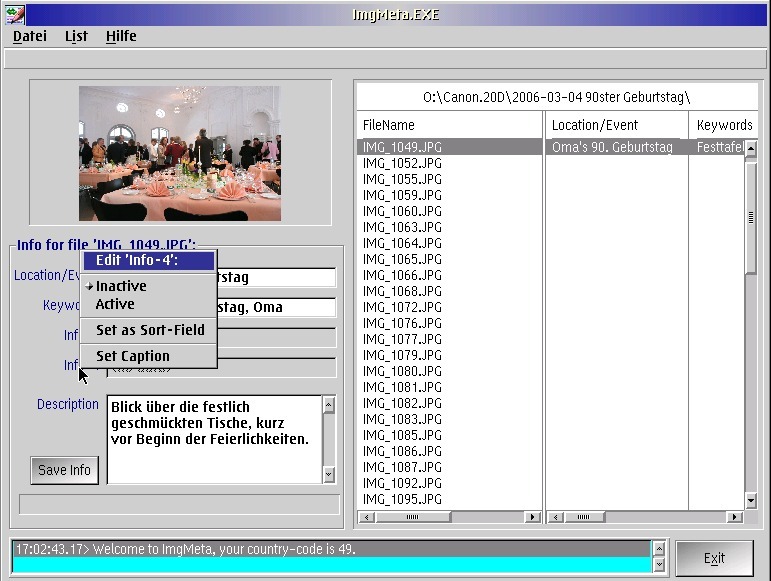 Note: ImgMeta is a small comprehensive tool to add meta-info to image-files. But as a price of simplicity you will soon reach the limits of the program. Anyone who needs a more powerful image-database and will accept a somewhat greater amaount of know-how to acquire should turn to Calydos, from the same author. It's free as well. Here is what the program looks like. The left part is composed of the (thumbnail) image and the entry fields for the description data. The right part is filled with the list of images in the current directory. The program window may be resized as you like by simply pulling the edges with the left mouse button. The directory containing the selected file is handled internally as 'current directory'. Selecting 'current directory' results in a list of that directory. If you choose 'browse...' then a File Open dialog is presented where you may select any directory of your choice. A doubleclick on one of the files in the list will bring that image into operation, the same as it would using (1). 'Operation' means: You may enter (up to) five informations which describe the image, then click on 'Save Info'. It is recommended before the first time usage to rename all of the five info-fields to a name that suit your needs (e.g. 'Location', 'Person', 'Keywords' etc.). To perform a rename you must position the mouse pointer over the appropriate field-caption (NOT the entry field!) and click right mouse button. Select 'Set Caption'. If an image file is loaded a thumbnail image is displayed. In order to edit / display the original image you need a separate program, such as PMView. To start this program you must invoke the context menu over the thumbnail image and select 'Load into external image program'. Or simply doubleclick on the thumbnail image. At first time a dialog appears asking you where to find the image program. In future cases these dialog won't appear. If you want to specify another image program you must hold down the CTRL-key while clicking on 'Load into external image program' so the File Dialog appears again. Using the 'List'-function results by deafult in a list of all files in a directory. You may specify that you want only images listed that have meta-informations. To do this you select List -> Options. In order to have the list sorted you must invoke the context menu over the list and select your appropriate field as sort-criteria. Extended Attributes (EA) only exist with OS/2, that means, you may pass your images to any non-OS/2-user, but the meta-data will not go with them. and only from within ImgMeta, because before starting the external image program the EAs will be saved and restored after return from the external image program. ImgMeta is totally freeware, i.e. free of charge as well as free of any responsibility and warranty. You are not permitted to use the program if you do not agree to this condition. Program: ImgMeta.zip There is a simple installation-procedure. Just download and unzip into a new (empty) directory and start install.cmd.